With an abandoned degree behind her and a thirtieth birthday approaching, amateur writer Bonnie Falls moves out of her parents’ home into a nearby flat. 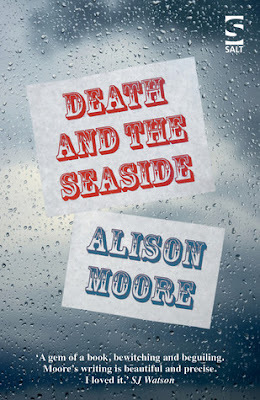 Her landlady, Sylvia Slythe, takes an interest in Bonnie, encouraging her to finish one of her stories, in which a young woman moves to the seaside, where she comes under strange influences. As summer approaches, Sylvia suggests to Bonnie that, as neither of them has anyone else to go on holiday with, they should go away together – to the seaside, perhaps. The new novel from the author of the Man Booker-shortlisted The Lighthouse is a tense and moreish confection of semiotics, suggestibility and creative writing with real psychological depth and, in Bonnie Falls and Sylvia Slythe, two unforgettable characters. For the first half of this book I was really unsure of it! It just wasn't going anywhere.... And then boom! It all clicked into place and I couldn't get enough of it! A very cleverly written book with such a dark undercurrent, that is quite unsettling to read and it quietly pulls you into the menacing world created within. Bonnie is a pretty unremarkable character - she is kind of resigned to a quiet life, she's a worrier and full of self doubt and receives very little praise from her parents or those around her, and her only way of escaping is to write. She has created a story based on a character called Susan and the book dips in and out of the chapters she has written and the lines start blurring between Bonnie and Susan and you wonder if fiction is fact, or vice versa! When she becomes friends with her landlady, Sylvia, she finally receives some positive interaction with another human being, as Syliva encourages her to finish writing her novel and is very interested in creating the right atmosphere for Bonnie to get into character. Bonnie is also plagued by notes containing the word 'Jump' on them and you start to get glimpses into her mind where she prefers to be in rooms on the ground floor and what drove her to have episodes in her childhood where she jumps off piers she visits - all very bizarre. I loved the way the creepy factor gets increased as the story goes on. You always have a rather unpleasant feeling about what is happening around Bonnie and her writing, and especially the way she is treated by people she comes into contact with. The pace is slow which did take a while for me to come to terms with, but it made sense by the end of why I think the author approached telling the story this way! I listened to the audio version of this and really enjoyed the way the story was told, especially the second half!